Muni 0130 outside of the Western Railway Museum car house. Car 0130 was built in the shops of the United Railroad in San Francisco in either 1904 or 1905. The record is unclear. The crane mechanism was purchased from Northern Engineering Works of Detroit Michigan in 1904. The car was probably built at United Railroad’s 28th street car house. It was not built from the remains of car 1310, which was damaged by fire on April 18, 1906. The San Francisco city archives have glass plate negatives showing 0130 working in March 1906. In 1912 the URR became part of the Market Street Railway system. 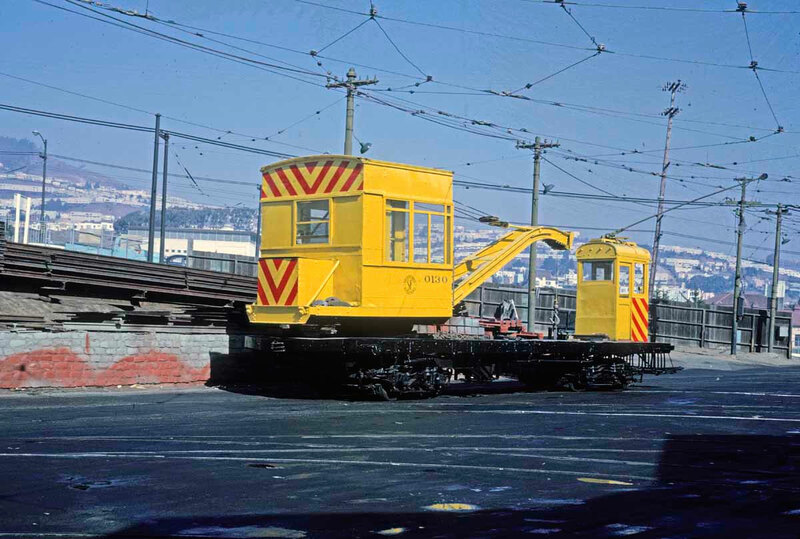 In September 1944 car 0130 passed to the San Francisco Municipal Railway when they acquired the properties of the Market Street Railway Company. 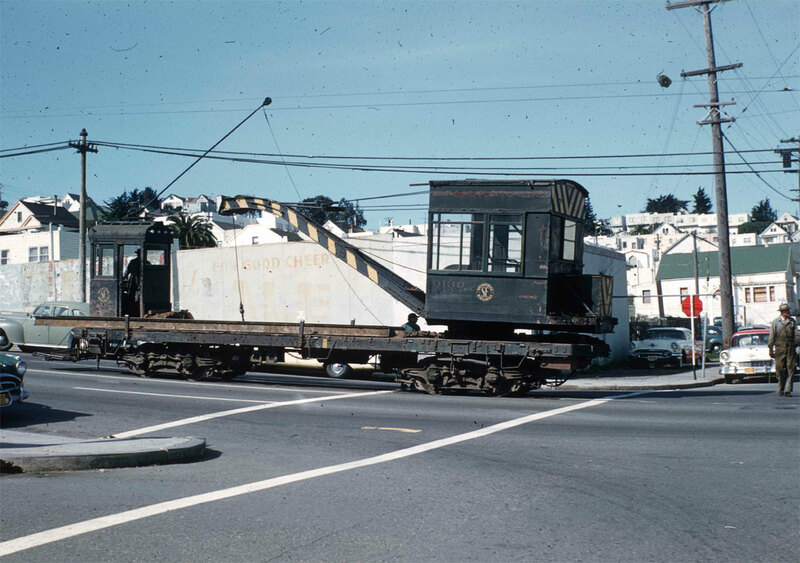 It was of limited use on the MUNI because it was too large to fit through the Twin Peaks tunnel. The car was acquired by the Western Railway Museum in September 1973. 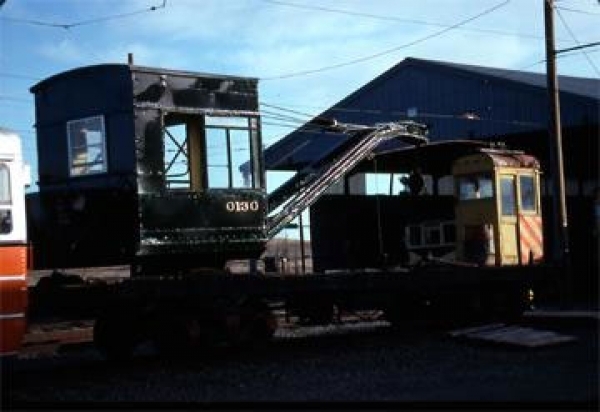 Originally the car had a wooden cab, wooden deck, and two trolley poles, one on the crane and one on the cab. The cab and deck are now steel. The car was modified to have only one trolley pole, which is on the cab. The trolley pole change was made because the boom would occasionally hit the pole on the crane. The crane had a capacity of 5 tons at a 20-foot radius. Owners: San Francisco Municipal Railway 0130. United Railways of San Francisco. Market Street Railway. Technical Data: Self propelled 5-ton crane. Built by United Railroad in San Francisco in 1904 or 1905. Total car weight, 68,000. Trucks: Peckham 14B3S. Wheels, 31-inch diameter. Axle, 4 1/2”. Journals, 3 3/4 X 7 plain bearings. Traction motors, 4-37 horsepower @ 500 VDC, inside hung. Air Brake Equipment: Westinghouse Traction Brake, SM3. Motorman’s valve. Brake cylinder. Air compressor, National A4. Dimensions: Width, 8’ 8”. Length over buffers, 41’ 8”. Height. Truck centers. Truck wheelbase. Propulsion Equipment: General Electric type K. Controller, K-12. Traction motors, GE 58. Power resistors. Misc Data: Trolley wheel, 6”. Trolley base. Current Condition: This car is complete. The correct trucks are not under it. They need new wheels and axles. Proposed Future Treatment: Rebuild trucks and traction motors. Install new roof. Maintain in current condition.